When we talk about films made in the Tamil language we really speak about films made in neighboring India. Although more than a score f films had been made in this country in Lankan Tamil films fall short of quality and quantity. There is evidence of advanced technology used and one could discern new way of treatment of stories in contemporary Indian Tamil films. The film industry in India has progressed very fast and films produced in Chennai (Kodambakkam) outnumber the number of films produced in other parts of India. This is so particularly in some years. However I don't watch many Tamil films at present due to various reasons. Earlier, particularly after the 1950s, I had seen fairly good number of entertaining Tamil films that suited my taste and understanding of the medium of cinema then. Like me there might have been some vintage readers who could have enjoyed such films earlier. For the benefit of young readers let me mention in passing some striking aspects in old Tamil films. Reading about the Tamil Cinema, we learn that it has an 80 years history since 1931. During the first decade of the 1939s a great number of films were musicals in the sense there were lots of songs and actors who could sing held sway. The Thiravida Munnetra Kalagam (DMK) became an embryonic political force in Tamilandu state in the 1940s. Two of the writers belonging to this camp eventually became the Chief Ministers of the State. They were the late C N Annathurai and the now ousted Chief Minister, M Karunanithi. Ironically the present C M of the State, Jeyaram Jeyalaltha was also a dancer and actor in South Indian films. So politics and cinema in Tamil Nadu is intertwined. The 1949 film 'Velaikaari' (Servant Woman) was based on a novel by C N Annathurai, and directed a man with Lanka connection A S Saami. It set a new pattern in making a film with social consciousness. The idea of making purposeful films led to underline the significance of story and dialogue to communicate with the masses. 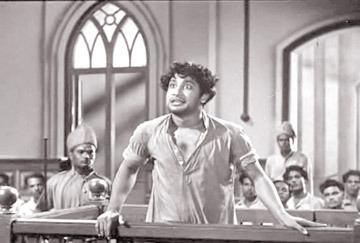 Parasakthi (The Goddess Shakthi) introduced the late Chevalier Sivaji Ganshan who gave expression to the largely satirical story and brilliant dialogue of Muthuvelu Karunanithi by his histrionic acting that also exhibited his innate talents to vary his acting style with distinct mannerisms. There were films earlier too pinpointing social imbalances in feudal societies. For instance the film 'Nanthanaar' depicted the caste problem. WE are informed that this folk epic of also-called low caste devotee has been filmed five times. I liked the songs sung by the Professor of Carnatic Music, M M Thandapaanui Thesigar who played the main role in the film. Another film of great significance was 'Ambigapathy' directed by an American Ellis R Dungan. The story had some resemblance to Shakespeare's 'Romeo and Juliet'.